The U.S. Federal Reserve on Tuesday moved forward aggressively with an effort to drive down mortgage costs, setting a goal of buying $500 billion in mortgage-backed securities (MBS) by mid-2009. The central bank said it would start buying the securities in early January under a program announced last month. When it announced the program, mortgage rates dropped in anticipation of the purchases. Still, some analysts on Tuesday expressed surprise with how vigorously the Fed was pledging to act and the news propped up prices for MBS in very thin trade. "When they are buying along the lines of $80 billion to $100 billion a month, if they're going to do it in six months, they have to buy everything they can get their hands on," said Kevin Cavin, a mortgage strategist at FTN Financial in Chicago. "It will push up prices and tighten spreads and push down primary mortgage rates," he said. The Fed selected investment managers BlackRock, Goldman Sachs, PIMCO, and Wellington Management to implement the program. Earlier this month, the Fed cut benchmark U.S. interest rates close to zero and signaled that it was turning more heavily to unconventional measures to spur the economy. On Tuesday, it said it would increase the money supply to make the MBS purchases, effectively easing monetary policy further. The program only covers securities issued by government-sponsored mortgage enterprises Fannie Mae and Freddie Mac and government loan financer Ginnie Mae. When it announced the program on November 25, the Fed also said it would buy up to $100 billion in debt issued by Fannie Mae, Freddie Mac and the Federal Home Loan Banks, and after its meeting on interest rates on December 15-16 it said it could press even more heavily into mortgage markets. "The goal of the program is to provide support to mortgage and housing markets and to foster improved conditions in the financial markets generally," the Fed said in a statement on Tuesday. The central bank said it would adjust the pace of its purchases based on changing market conditions and the impact of the program. The initiative is aimed at reducing the cost of credit and increasing its availability, which authorities hope will support housing markets and foster improved financial conditions generally. Investment managers are needed because of the size and complexity of the program, the Fed said. Investor appetite for debt issued by Fannie Mae and Freddie Mac had dried up since the government seized control of both companies in September. Before you head out to all of the New Year's Eve parties, how about some background on the "New" Times Square New Year's Eve Ball. The U.S. Treasury said on Monday it was pumping $5 billion into auto and mortgage lender GMAC, LLC and lending up to $1 billion to automaker General Motors, ensuring the solvency of a company considered crucial to GM's survival - to be used for restructuring GMAC as a bank holding company. The Treasury Department said it would buy $5 billion in senior preferred equity with an 8% dividend from GMAC. The Treasury said it was dipping into a $700 billion bailout fund to buy equity in GMAC and lend to GM, the latest in a string of capital injections aimed at easing the worst credit crisis since the 1930s. Last week, GMAC won Federal Reserve approval to become a bank holding company, giving it access to the emergency source of funds and helping it avoid bankruptcy. The company, co-owned by GM and private equity firm Cerberus, has lost $7.9 billion over the last five quarters as the credit crunch lifted its borrowing costs sharply and the value of many of its assets plunged. The SEC would also require companies to report oil and gas reserves using an average price based on the prior 12-month period, rather than a year-end price (as currently used). That would help investors compare companies' reserve estimates and mitigate price distortions, the SEC has said. Companies have to comply with the new reporting requirements after December 15, 2009. "These updated rules consider the significant changes that have taken place in the oil and gas industry since the adoption of the original reporting requirements more than 25 years ago," John White, head of the SEC's corporation finance division, said in a statement. A consortium of private equity and hedge fund firms, including J.C. Flowers & Co, is close to a deal to buy the assets of failed mortgage lender IndyMac, a source familiar with the matter said on Sunday. The prospective buyers also include Dune Capital Management, a private investment firm run by former Goldman Sachs executives, and hedge fund Paulson & Co, the source said. The consortium would buy the bank and its 33 branches, IndyMac's reverse-mortgage unit and a $176 billion loan-servicing portfolio, the source said. The presence of private equity and hedge fund firms comes after the FDIC said last month it was expanding the pool of qualified bidders to include those institutions that do not currently have a bank charter, although they must have conditional approval for a charter from the responsible agency. The Federal Deposit Insurance Corp and IndyMac as well as the buyers in the consortium could not be immediately reached. Last week IndyMac spokesman Evan Wagner said a deal was expected before the end of the year. The deadline for final bids for IndyMac's assets was December 15. FDIC estimates IndyMac's failure cost the agency $8.9 billion. Barclays Capital and Deutsche Bank are advising the FDIC on the sale. The mortgage specialist's IndyMac Bank unit was taken over by regulators after it failed on July 11 in one of the largest bank failures in U.S. history. At the time, it had $32 billion in assets and $19 billion in deposits. IndyMac Bancorp, Inc., the holding company, filed for Chapter 7 protection soon after with the U.S. bankruptcy Court in Los Angeles, indicating it plans to liquidate. Founded in 1985 by Angelo Mozilo and David Loeb, who also founded Countrywide Financial Corp, IndyMac once specialized in "Alt-A" home loans, which often didn't require borrowers to fully document income or assets. It collapsed after defaults mounted and as tight capital markets caused losses on mortgages it couldn't sell. The seizure came after panicked customers withdrew more than $1.3 billion of deposits over 11 business days. The withdrawals followed comments in late June by U.S. Sen. Charles Schumer questioning IndyMac's survival. Wal-Mart said on Friday it will start selling Apple's iPhone on Sunday, but the popular cell phones that can surf the web will not be priced as low as some anticipated. Wal-Mart plans to sell the black 8-gigabyte iPhone 3G model, which also holds about 2,000 songs, for $197. The 16-gigabyte model, in black or white, will be priced at $297. All of the phones require a new two-year service agreement from AT&T or a qualified upgrade, Wal-Mart said. The move gives Apple the chance to reach millions of Wal-Mart shoppers who may not be as familiar with the company's products. Wal-Mart typically appeals to a lower-income group of shoppers than those who buy Apple's Macintosh computers, iPods and iPhones, which are typically more expensive that other PCs and music players. But the world's largest retailer has also lured new customers seeking low prices in a recession. Wal-Mart was one of few U.S. retailers whose sales fared well in the weeks after Thanksgiving and it is trying to keep shoppers coming back to its stores after Christmas. It ran a commercial on Friday morning showing a mother taking her son to Wal-Mart to spend the gift card he got for the holiday. While the commercial did not refer to iPhones, it did show the pair heading into the electronics section of a Wal-Mart store. Wal-Mart's move may put pressure on Best Buy, the largest consumer electronics retailer. Until now, Best Buy had been the only retailer besides Apple's own stores and AT&T stores selling the iPhone. Best Buy currently has the 8-gigabyte iPhone on sale for $189.99 and the 16-gigabyte version for $289.99, each priced $10 less than their usual price at Best Buy. Wal-Mart also said its stores could match local competitors' advertised prices during a promotional period. Apple posted a stronger-than-expected 26% rise in fiscal fourth-quarter profit in October, spurred by strong sales of the faster, next-generation iPhones. Apple sold 6.89 million iPhones during the quarter, which ended on September 27. In the end, the move to open iPhone sales at Best Buy, already being sold, and now Wal-Mart, starts on Sunday, can only be viewed as positives for all companies involved. With the number of Best Buy and Wal-Mart gift cards (or returns that are now gift cards), how many of those will go towards the phones and accessories? For AT&T it is a new subscriber or continuing subscriber with a new 2 year agreement - with data and phone packages. For Apple, it is the sale of the iPhone, but also the connection with the end user that could open them up to notebooks, Macs, iPods, etc. As long as Apple keeps making good consumer products with a cutting edge feel, the more retailers they have, the better the end results. As many of you know, my father was a district superintendent for the Methodist Church, and he directly supervised over 120 rural churches in Southwest Virginia and Northeast Tennessee. On Sundays he would often travel to visit his churches, and since I was the youngest in the family I was often brought along for the ride. Many of the churches that we visited only had 15 or 20 families as members, and after the Sunday service my father would meet with the church’s minister. It’s funny how certain events bring me reeling back to memories of my father. For instance, I thought I had a good deal when I bought my very first home in 1975 in Decatur, Georgia for $32,000. At that time, interest rates on home mortgages were at approximately 11%, which actually seemed relatively low given the high inflation rates in the mid 1970’s. As you may recall, this was just after the oil embargo of 1974. When I proudly went over the details of my home purchase to my father, he reminded me that after World War II, he was able to obtain a mortgage loan at 5% interest. Isn’t it interesting that 65 years later, you can actually get mortgage loans at lower interest rates than what my father was able to obtain just after World War II? All of the recent talk in the media comparing our current scenario with the Great Depression has reminded me of some of my father’s sermons. The sermons that resonated most with me concerned events that he had lived through himself. Of course he spoke of religious events in his sermons, but I was always captivated when he spoke of more recent events when preaching. Two topics in his sermons that I found particularly interesting concerned the bombing of Pearl Harbor and the death of Franklin Delano Roosevelt. When speaking of Pearl Harbor in his sermons, my father spoke of what a terrifying and trying time it was for Americans. As Americans were coming home from church on Sunday, December 7, 1941, they found out that the Japanese had unilaterally attacked the U.S. naval base at Pearl Harbor. Hawaii was not admitted to the Union until August of 1959, but because it had been a U.S. territory for nearly 60 years, it was considered to be part of the United States. Until the bombing of Pearl Harbor, the U.S. had basically been neutral in World War II, although we were steadily increasing embargoes and sanctions after Japan’s expansion into French Indochina. The day after Pearl Harbor was bombed, the U.S. declared war on Japan and subsequently, on Germany. Considering that Pearl Harbor wasn’t actually a part of the U.S. Union at the time of the attack, there have been only a few very minor attacks on U.S. soil since the mid 1800’s with the exception being September 11, 2001. My father also liked to talk about President Franklin Delano Roosevelt in his sermons. As many know, FDR was elected to four terms in office as U.S. president – the only U.S. president to have served more than two terms – and he was beloved in America and throughout the world. FDR served from 1933 to 1945, during the Great Depression and during World War II. His unexpected death on April 12, 1945 left the nation in shock and in grief. The other night, I watched a three-hour special on FDR on the History Channel, which took me reeling back to my father’s sermons. I learned an enormous amount watching the show that I hadn’t known before. Much of it had to do with economics during the Great Depression and the general state of FDR’s health. I had always heard that the real turn in the Great Depression occurred when FDR was elected in 1932 and instituted a massive public works program called the “New Deal” upon entering office in 1933. It was my understanding that this flood of spending by the Federal government on these public works programs during the Great Depression was what allowed economic recovery and prosperity. As I will explain later, the impression I had was woefully incorrect. I also remember my father’s impression that FDR died suddenly and without warning. While his declining health had not been released to the general public, he had been looking old, thin and frail in the months leading up to his death and it was common knowledge to those close to him that he was not in good health. In fact, one of his secret service agents exclaimed that at the time of FDR’s death, he was just a shell of a person in a big suit. His body had deteriorated to the point that his eyes were sunken and he suffered almost constant debilitating pain. But the public at large was never made aware of FDR’s increasing health issues. On the afternoon of April 12, 1945, FDR died of a massive cerebral hemorrhage after complaining of a terrible headache. It seems strange today that the health of the most important political figure in the world was hidden from the public. Today, no one in public office has any secrets. As you can see below in the chart entitled, “U.S. 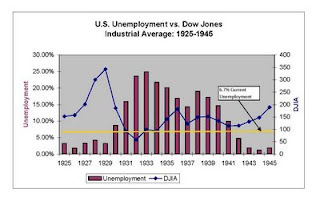 Unemployment vs. Dow Jones Industrial Average: 1925-1945,” when FDR took office in 1933, the unemployment rate in the U.S. was a staggering 25%. While the rate declined to 14% in 1937, it increased again from 1938 to 1940 to rates between 15% and 20% before declining to rates below 5% in 1942 with the start of World War II. Comparing the unemployment rates of the Great Depression to our current unemployment rate of 6.7%, you can see the incorrect comparisons being made by the media concerning our current economic environment and that of the Great Depression. The chart also illustrates my misperception of the success of the New Deal, leading me to perform some research to determine why it was unsuccessful. FDR was an old-fashioned politician who believed that the government shouldn’t spend money that it didn’t have, which makes sense theoretically, but really doesn’t work. And so, even though FDR wanted to do public works projects, he didn’t want the government to borrow money to make these projects work. Therefore, from 1933 through 1940, the Federal government didn’t borrow any money in an effort to stimulate the economy. Additionally, the Federal Reserve System believed that it shouldn’t interfere with banks and instead allowed those that were unsuccessful to fail, causing thousands of bank failures in the United States during the 1930’s. Comparatively, 25 banks have failed in the U.S. during 2008. Also, since the Federal government was not collecting as much tax revenue due to the poor business environment, Congress – in its misplaced wisdom – increased taxes on an already failing economy. The combination of no deficit spending, a Federal Reserve that was draining cash out of the system and higher income taxes led to almost a decade of high unemployment and devastating economic conditions in the United States. In early 1941, the United States was forced to enter World War II. At that point, we had no choice but to use deficit spending to create the armaments necessary to fight the war on two fronts. I’m sure all of you have heard about Liberty selling war bonds – these are now known as the U.S. government-guaranteed bonds that we read about in the papers today. As you can see from the chart, once the government began deficit spending, the unemployment rate fell dramatically in the early 1940’s. Coupled with the enlistment in the armed forces and the manufacturing necessary to make war products, the U.S. economy moved into high gear with virtually full employment in 1944 and 1945. This chart also shows the Dow Industrial Average for the years of 1925 to 1945. As you can see, the market crashed in 1929 and continued to go down through 1932. It then rallied upward, even in spite of the most horrific economic news possible. After a downturn beginning in 1936, it began moving upward at the beginning of World War II. This chart is on the Dow Jones Industrial Average only; it doesn’t include dividends. In any case, those of you who believe that it took 25 years for the stock market to recover after the crash of 1929 can plainly see that that’s not the case. If you include reinvested dividends in the average, the full value of the 1929 crash was recovered in approximately 10 years. I am writing this to illustrate that the Federal Reserve’s action this fall relatively assures us that the economy will snap back rather quickly. As noted on the chart above, the economy continued to struggle with no improvement during the time that the Federal Reserve was not deficit spending. However, immediately after the Federal Reserve began borrowing money and pouring it into the economy, unemployment decreased and the stock market exploded upward. The chart above clearly demonstrates the dynamic impact of flooding the economy with cash. Not only is the effect positive, it is also incredibly fast. Over the last several months, I’ve been discussing the Federal Reserve’s techniques for putting money into the economy. Interest rates have been reduced to virtually zero, and the Federal Reserve has also used their open market capabilities to fund and purchase distressed assets from banks and become the lender of last resort for a frozen economy. The Fed has additionally pumped money into virtually every business in need of short-term liquidity. It’s now estimated – probably conservatively – that the Federal deficit for 2009 will be close to $1 trillion. While that number is enormous, it is necessary in reviving our economy and recreating the confidence required to move the U.S. economy forward. I have also provided a chart below of the Federal Reserve’s money base entitled “St. Louis Source Base: Billions of Dollars: NSA.” All the money in the U.S. economy begins with this base of cash generated by the Federal Reserve System. Please note that the chart moved up gradually from 2002 through 2008 before it exploded and virtually doubled over a relatively short amount of time. As you can tell, the actions by the Federal Reserve today are completely different from those taken during the 1930’s. In the 1930’s, taxes were increased, cash flow was decreased, the money supply was decreased and the government did not utilize deficit spending. In 2008, however, taxes were decreased, the money supply was increased to the point of explosion and deficit spending was used to create commerce. Those of you who fear that this recession will be prolonged just do not understand the dynamic impact of flooding our economy with this much cash. In my last post, I tried explaining why the Federal Reserve System is making cash the equivalent of trash as it pertains to investing. If you haven’t read that post, here’s the link – Cash Is Trash. Some readers questioned what safe alternatives there are to CD’s, money market accounts and other investments of that nature. Something that always escapes me is why someone would be willing to invest in a money market account making less than one-half of 1% annualized when there are viable alternatives. For example, you can currently purchase something like Consolidated Edison, which has an annualized return on dividends of 6.1%. Utility companies have no competition since they are a monopoly in the New York area. Even more interesting is that the almost miniscule interest being earned on money market accounts is taxed at a maximum rate of 35%. Dividends earned from Consolidated Edison are only taxed at 15%. Which seems like a better investment to you? I can almost understand the reluctance to make such an investment if the rates were similar, but when you can earn almost twelve times the rate of return with the very conservative investment of Consolidated Edison as compared to a money market account and also enjoy a significant tax benefit, then further analysis at the very least seems to be warranted. It seems like the media has become the proverbial Grinch that stole Christmas. I awoke this morning to another depressing headline on Yahoo: “One in Five U.S. Adults Have More Credit Card Debt than One Year Ago.” I suppose it would’ve been a reach to explain that four out of five adults had less credit card debt than one year ago. Leave it to the media to emphasize the negatives, but maybe I suffer from “glass half full” syndrome. It also seems like everyone is proclaiming that this Christmas season will be the worst for retailers in over 40 years. From a totally unscientific standpoint, every retail operation I’ve visited over the last month has been tremendously busy. It wouldn’t surprise me to see the figures in January reflect that retail sales are flat – not negative – for December. As we get through the holiday season and investors once again have the confidence to open their investment account statements, I hope they will closely evaluate the investments that offer the opportunity to earn many times the rate of return currently offered for cash. Just as the Federal Reserve wants you to believe, cash as an investment is poor as compared to higher yielding investments that have very little risk attributes. Once this tremendous supply of cash is reinvested, the stock and bond market will get back to its normal range and the potential for profit will be enormous. We wish you and yours very happy and healthy holidays. Rollins Financial Counseling, Inc. and Rollins & Associates, P.C. 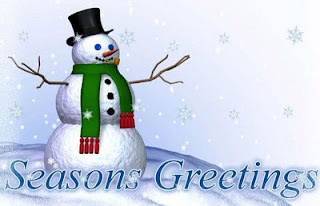 wishes all of our clients, readers, and their families Seasons Greetings! Note: We will be closed on Thursday, December 25 and Friday, December 26 for Christmas. The firm will also be closed on Thursday, January 1 for New Years Day. With the Christmas holiday on Thursday, Wednesday will be a shortened trading day with the stock market closing at 2:00 EST. Today's post covers many subjects to bring you up-to-date on the latest happenings. Toshiba plans to invest about 30 billion yen ($330 million) to build a new plant to produce rechargeable lithium ion batteries, Kyodo News reported Wednesday, citing people familiar with the matter. Although Toshiba has scaled down production in its core semiconductor business amid the global economic slowdown, they have decided to boost investment in the promising rechargeable battery business, as demand for such products is expected to grow for use in electric vehicles and industrial machines, the report said. The battery, known as the "Super Charge Ion Battery," can recharge to 90% of full capacity in less than five minutes and has a life cycle of over 10 years, Kyodo reported. The construction of the new plant will begin next year. The National Retail Federation on Tuesday said it has asked President-elect Obama to include sales tax-exempt shopping days in March, July and October 2009 as part of his economic-stimulus program. The trade group said the proposed tax-holiday periods, which would last 10 days including two weekends, would help boost consumer confidence and spending. Tax-free treatment would apply to all tangible goods subject to a state sales tax ranging from apparel and home furnishings to restaurant dining and automobiles but would exclude tobacco and alcohol. The federal government would reimburse the 45 states that have sales taxes for the lost revenue, and would provide the five states without a sales tax (Alaska, Delaware, Montana, New Hampshire and Oregon) with revenue approximating the sales tax reimbursement that would be received by states with similar population. State sales tax rates range from 2.9% to 7.25% and add $236 billion a year to the amount U.S. consumers pay for goods and services, according to the U.S. Census Bureau. By temporarily lifting the sales tax for the three 10-day periods, NRF estimates that consumers could save nearly $20 billion. Based on the 112.4 million households in the United States, the figure would amount to almost $175 for the average family. Wal-Mart said late Tuesday it will settle 63 wage and hour class action lawsuits against the company, some of which have been pending over the last several years. The world's largest retailer said it will pay out a settlement of $352 million to $640 million, and use "various electronic systems and other measures" to ensure compliance with applicable wage laws. Wal-Mart said it will take a fourth-quarter after-tax charge of about 6 cents a share as a result. Crude-oil futures fell Tuesday, following a 6% slump in the previous session, on weaker demand. Crude for February delivery closed down 93 cents, or 2.3%, at $38.98 a barrel on the NYMex. Gasoline and heating-oil futures also moved lower. Natural-gas, however, surged as much as 9% as Russia and other major producers gathered in Moscow to seek closer ties. Russia Prime Minister Vladimir Putin said that the era of cheap gas is coming to an end, and gas producers will cooperate more closely to try and make the gas market more predictable, according to media reports. Wachovia announced today that its shareholders approved the Wells Fargo merger at its special meeting of shareholders. The merger was approved by approximately 76% of the votes entitled to be cast by the holders of Wachovia's outstanding shares of common stock and Series M preferred stock, including a majority of the outstanding shares of Wachovia's common stock. "We are pleased that Wachovia's shareholders agree that the Wells Fargo/Wachovia combination will provide superior growth and long-term value to shareholders, customers, employees and our communities," said Robert K. Steel, CEO of Wachovia. "We received overwhelming support from Wachovia's shareholders today, with approximately 96% of the votes cast by Wachovia shareholders approving the transaction." "We believe our combined company will be a compelling value for Wachovia shareholders - and today's vote shows they agree," said Wells Fargo President and CEO John Stumpf. "Shareholders' approval is a major step toward completing the merger and we now look forward to the official merger of our two companies a week from tomorrow. The actual merger integration of our companies' systems, operations, products and services will be done very thoughtfully and deliberately over the next two to three years. I want to assure all customers of both companies that we'll approach every discussion on the integration and conversion from the standpoint of what's best for our customers." Wells Fargo and Wachovia Corporation announced their intention to merge on Oct. 3, 2008. The transaction is expected to close by the end of the year. Rollins Financial Counseling, Inc. and Rollins & Associates, P.C. will be closed on Thursday, December 25 and Friday, December 26 for Christmas. The firm will also be closed on Thursday, January 1 for New Years Day. We wish all of our clients, friends, and families a happy and safe holiday season. President-elect Barack Obama's new "green dream team" is committed to battling climate change and ready to push for big policy reforms, in stark contrast with the Bush administration, environmental advocates said on Monday. "If this team can't advance strong national policy on global warming, then no one can," said Kevin Knobloch, president of the Union of Concerned Scientists, referring to Obama's picks for the top energy and environment jobs in his administration, which takes office on January 20. "This caliber of scientists in any administration would be a major headline," Knobloch said by telephone on Monday. "But in contrast to the eight years of the Bush administration, where political appointees ran roughshod over science at a terrible cost to the truth, they stand out even more." Last week, Obama picked a Nobel physics laureate, Stephen Chu, to head the Energy Department; former environmental lawyer and U.S. Sen. Ken Salazar as Interior secretary; former New Jersey environment chief Lisa Jackson to head the U.S. Environmental Protection Agency; Nancy Sutley, deputy mayor of Los Angeles, to run the White House Council on Environmental Quality. The president-elect tapped Carol Browner, who headed the Clinton administration's EPA, to take a new White House position coordinating policy on energy, environment and climate change. For White House science adviser, Obama chose John Holdren, a Harvard University expert on climate change. For the National Oceanic and Atmospheric Administration, which deals with weather and climate among other matters, Obama named Jane Lubchenco, a marine biologist who has been sharply critical of that agency for allowing overfishing. "Each one of them is not only experienced and capable ... but also very, very committed to doing something on climate," said Tony Kreindler of advocacy group Environmental Defense Fund. "They really get the connection between climate change and economic growth and how pursuing renewable energy can create jobs." Obama has pledged to create 5 million green jobs and break U.S. dependence on foreign oil, investing $150 billion in the next decade to build an energy economy that relies on renewable sources such as wind, solar and geothermal energy. "None of this will be easy, because some of the powerful special interests and their allies still have their heads in the sand," said Gene Karpinski, president of the League of Conservation Voters. However, Karpinski said that with Obama's "great new green dream team" and more members in the U.S. Congress who support action to curb climate change, a law to limit greenhouse gas emissions is more likely, as is a global agreement to succeed the current phase of the carbon-capping Kyoto Protocol. Even most of those who disagree with Obama on climate change accept the qualifications of his appointees, but Myron Ebell of the pro-business Competitive Enterprise Institute criticized Holdren and Lubchenco as being "on the scientific fringe of global warming alarmism." Environmental groups have clashed repeatedly with the Bush White House on science policy, especially when that was at odds with energy policy. President George W. Bush vowed to regulate carbon emissions when he campaigned for the White House in 2000, but changed course soon after taking office in 2001, and for most of his tenure voiced skepticism that cutting back on human-generated carbon dioxide emissions would solve the problem. Under his stewardship, the United States has been alone among major industrialized nations in rejecting the carbon-capping Kyoto Protocol. Bush has refused to impose economy-wide limits on carbon emissions, maintaining that this would hamper U.S. competition with fast-growing, big-emitting economies like China and India. Bush's Environmental Protection Agency chief has balked at limiting climate-warming carbon emissions, even after the U.S. Supreme Court ruled that the agency has the power to do this. U.S. President-elect Barack Obama unveiled a new task force on Sunday charged with helping struggling working families, as an aide said Obama's economic recovery plan would be expanded to try to save 3 million jobs. Biden's panel of top-level officials and labor, business, and activist representatives would help keep working families "front and center every day in our work," Obama said in a statement released by his transition office. Biden said the economy was in worse shape than he and Obama had thought it was. "President-elect Obama and I know the economic health of working families has eroded, and we intend to turn that around," Biden told ABC's "This Week." "We've got to begin to stem this bleeding here and begin to stop the loss of jobs in the creation of jobs," he said. An transition aide said grim forecasts for the economy Obama will inherit when he takes office on January 20 prompted him to raise the job-creation target of his economic recovery plan to 3 million jobs created or saved in the next two years. Last month, Obama's stated goal had been to protect 2.5 million jobs with a combination of middle-class tax cuts, money for public works programs like the building of roads and mass transit as well as money to bolster health and other social programs. "There is going to be real significant investment, whether it's $600 billion or more, or $700 billion," Biden said. "It's a number no one thought about a year ago." The Obama administration could not afford to worry initially about the ballooning national deficit in the face of the most severe recession in the post-war era, he said. "There is no short run other than keeping the economy from absolutely tanking. That's the only short run," said Biden. Some Democrats are pressing for a package in the $1 trillion range, though other lawmakers are wary of the discussion of price tags upward of $600 billion. Republican Rep. Eric Cantor of Virginia told CNN's "Late Edition" that taxpayers must be protected amid a pricey bailout for the auto industry and other potentially costly measures to revive the economy. "Most American taxpayers are scratching their head wondering when all this bailout stuff is going to end and probably thinking when is my bailout coming," he said. But Massachusetts Democratic Rep. Barney Frank argued that failure to act "will cost us even more," he told CNN. With all of the news this past week about Bernard Madoff and his $50 billion Ponzi scheme, we thought it would be interesting to look at some history of the scam. While CNBC is doing a show on Madoff's scheme called "Scam of the Century? Bernie Madoff & The $50 Billion Heist," we wanted to look at some of the past scams in American finance. The Wall Street Journal must have been thinking the same thing because John Steele Gordon wrote a great Op-Ed piece for Wednesday's WSJ that we thought was too good not to pass along. How President Grant was taken by the Madoff of his day. By his own admission, Bernard Madoff has catapulted himself into the major leagues of Wall Street fraud. That is no small accomplishment, given some of the more famous frauds of the past. But a $50 billion Ponzi scheme is no small thing. To be sure, the number of still unanswered questions is huge. How could a Ponzi scheme last as long as this one and reach so fantastic a sum? Why didn't he take the money and decamp to some extradition-free country instead of admitting the fraud and waiting for the cops to show up? And, of course, how could so many sophisticated people be fooled for so long by an operation that, at least in retrospect, had red flags all over it? Ponzi schemes, where early investors are paid dividends out of the money put in by later investors, usually last only a few months. Charles Ponzi's eponymous scheme in 1919 started with just 16 investors and $870. Six months later, there were 20,000 investors who had put in $10,000,000. Ten million was a whole lot of money in 1919 and when it attracted attention, Ponzi soon found himself with a five-year jail term and the dubious honor of adding his name to the English language for a type of fraud he hadn't even invented. Most Ponzi schemes are penny-ante affairs, such as chain letters, that bilk their victims out of a few dollars each. Even Charles Ponzi's investors put in an average of only $500 each. But Wall Street's most famous Ponzi scheme was, like the present one, no small affair. And its principal victim was a man few associate with Wall Street at all -- Ulysses S. Grant. Ulysses Grant Jr., known as Buck, had been trained in the law and tried several businesses without success before coming to Wall Street. There he was befriended by Ferdinand Ward, a typical all-hat-and-no-cattle fast talker whom Grant was too naive to recognize as such. They soon formed a brokerage firm named Grant and Ward. Ward hoped to trade on the Grant name and when Gen. Grant moved to New York in 1881, four years after serving as president, he came into the firm as a limited partner, investing $200,000, virtually his entire net worth. Many people, hoping to profit by a connection with the former president's access to power in Washington, opened accounts with the firm. When Ward attempted to borrow money from the Marine National Bank, its president, James D. Fish, wrote Grant, who, as naive as his son, replied "I think the investments are safe, and I am willing that Mr. Ward should derive what profit he can for the firm that the use of my name and influence may bring." Grant meant it only in a general sense, but Fish thought the fix was in on government contracts going to companies that Ward said he controlled. But Grant, as honest as he was foolish about business matters, had flatly refused to lobby for government contracts. So Ward just lied and solicited investments from Grant's friends and well-wishers, promising large dividends to come from lucrative government contracts with the firms he was investing in. He then took the money and speculated with it. He kept the promised large dividends flowing by paying them out of the money new investors put in. It worked for awhile and, with the help of thoroughly cooked books, Grant and his son thought they were both seriously rich, worth $2 million and $1 million respectively. Grant began to go downtown regularly to the Grant and Ward offices, where he would greet new investors, who were suitably impressed to meet him. He didn't have a clue what was really going on. And of course, it all fell apart. Had Ward been a talented speculator he might have made it work. But he was utterly incompetent. By April, 1884, he was desperate. He had borrowed so much money from Marine National Bank that it would fail along with Grant and Ward, possibly setting off a major panic on the Street. So, ever the con man, he told Grant that it was the Marine National Bank that was in trouble and needed $150,000 to avoid failure, possibly bringing down Grant and Ward with it. Grant went to see William H. Vanderbilt, the richest man in the world, on the evening of May 5. Vanderbilt, anything but naive and never tactful, told Grant that "What I've heard about that firm would not justify me in lending it a dime." But Vanderbilt let him have the money, saying "to you -- to General Grant -- I'm making this loan." He wrote out a check for $150,000. Grant returned home and turned it over to a waiting Ferdinand Ward. When Grant went downtown the next morning his son told him that Ward -- and the money -- had vanished and that both Marine National and their own firm were bankrupt. Grant spent several hours alone in his office and when he left he passed through the crowd that had gathered outside, without speaking. Everyone in the crowd removed their hats as a sign of respect. Ward was soon caught and thrown into the Ludlow Street Jail. He spent 10 years in prison for grand larceny. But there was no saving Grant and Ward, which was found to have assets of $67,174 and liabilities of $16,792,640. By June, Grant had only about $200 in cash to his name. The failure, of course, was front-page news and people began sending him checks spontaneously, which he had no option but to accept. One man added a note to his check, "On account of my share for services ending in April, 1865." Every cloud, of course, has a silver lining, including the failure of Grant and Ward and the embarrassment of a national hero. Desperate to provide for his family, Grant finally agreed to write his memoirs, something he had stoutly resisted for nearly 20 years, thinking he couldn't write. Mark Twain's publishing firm gave him an advance of $25,000 -- a huge sum for that time. Soon after he began work, Grant learned that he had throat cancer and he hurried to finish the book so as not to leave his family destitute. He died three days after he completed the manuscript. The book was a titanic success, selling over 300,000 copies and earning Grant's heirs half a million in royalties. But the book was more than just a best seller. It was a masterpiece. With his honesty and simple, forthright style, Grant created the finest work of military history of the 19th century. Even today, most historians and literary critics regard Grant's memoirs as equaled in the genre only by Caesar's "Commentaries." One can only hope that something even half as good and significant can come out of the peculations of Bernard Madoff. Mr. Gordon is the author of "An Empire of Wealth: The Epic History of American Economic Power" (HarperCollins, 2004). It sure seems like our government is trying to convince us that “cash is trash” these days. In a time of incredible financial uncertainty, it appears that many investors feel more comfortable being in cash than in other types of investments. Cash seems to give investors a level of comfort that other investment classes just don’t seem to be able to provide. But I always find it ironic that people will flock to the malls to purchase clothes that are on sale while the average investor tends to avoid stocks at all costs when they are on sale. There’s no question that the government is encouraging investors to take more risk and invest in stocks and higher yielding bonds. The interest rates being paid by government-guaranteed debt are staggering. The Federal Reserve System clearly has a plan: They are attempting to make cash so unattractive from an investment standpoint that even the most unknowledgeable investor will redeploy their cash into something that has the potential for a higher rate of return. It may be hard to believe that as of this past Thursday, the benchmark 10-year Treasury bond sank to an annualized yield of 2.078%. That’s the lowest rate on a 10-year Treasury bond since November 1, 1977. A common barometer for mortgages is that they are priced 1.5% higher than the 10-year Treasury. Using the yield from Thursday, it’s possible that we might see a new mortgage rate at 3.6%. If we saw a 30-year mortgage at 3.6%, it would be the lowest ever recorded in the history of the United States. You may recall my suggestion from a few weeks ago that the Federal government could solve the real estate issue in the United States by offering long-term mortgages at 4%. At the time I wrote that post, it was actually a stretch to get the rates down to 4%. Based upon yields from Thursday, however, it is not only possible, but it is likely that rates could soon be at 4%. Even more astonishing than the rate on the 10-year Treasury bond is Thursday’s rate on the 30-year bond. It was only last Saturday that I wrote that the 30-year Treasury had briefly traded at the unbelievably low rate of 3%. Only five trading days later, the 30-year Treasury is yielding 2.547%. This is an extraordinarily low rate by any definition. As I mentioned a few weeks ago, it would be very simple for the Treasury to enter the open market and issue 30-year Treasuries at 2.547% and then inject that money into Freddie Mac and Fannie Mae to make 4% mortgages available almost immediately. The Treasury hasn’t announced that they will do this yet, but I feel relatively sure that they’ve read my posts and that this will almost assuredly come to fruition at some point in January. There is currently $3.76 trillion in money market accounts across the United States. Money market accounts are averaging a return of 1% per year, but this rate is falling dramatically and some of the major banks are already quoting money market rates at 0.2% on an annualized basis. It is hard to imagine why so many investors are willing to accept an almost minuscule rate of return. I find it fascinating that almost 60% of the entire value of all traded securities in the United States is currently in money market accounts. Traded securities now approximate $7 billion after the significant haircut they’ve taken in 2008. Money market accounts now represent over one-half of the value of all the listed securities in the United States. There is, of course, a major negative to the public concerning lower interest rates. Older investors who depend upon CD’s and other investments of this nature can no longer earn very good rates with these investment types. To support their lifestyles, even these investors will be forced into looking at alternative investments that will offer them a higher rate of return. This past Tuesday, the U.S. Federal Reserve System announced that their overnight lending rate would be decreased to 0.25% annualized. On Friday, the Bank of Japan announced that they would be reducing their overnight lending rate to 0.1% annualized. I want to make sure that everyone understands that I’m not talking about 1% annualized; I’m talking about one-tenth of 1% annualized. Therefore, all of the banks in the United States and Japan can essentially borrow the money for nothing from the government. The U.S. prime rate is currently 3.25%. It doesn’t take a genius banker to figure out that they can borrow money from the Federal Reserve at zero and loan it to the general public at the rate of prime and earn a 3.25% spread on the use of the Fed’s money. Those who argue that the reduction in the rate of prime means nothing to the average consumer are wrong. It may mean nothing to the traders on Wall Street, but it means a great deal to Main Street. Virtually all equity lines-of-credit enjoyed a rate reduction in 2008 from the prime rate of 7.25% at the beginning of the year to the incredibly low current rate of 3.25%. Almost all credit cards now have some sort of index off the prime rate. Coupled with the enormous reduction in fuel costs and the significant reduction in interest rates, almost all consumers have enjoyed a quasi-tax reduction in the last few months. The significant cash flow to the consumer in the reduction of gas and interest will ultimately improve consumer spending. Even with the incredibly low interest rates illustrated above, the Federal Reserve doesn’t seem to be satisfied. On Tuesday of this week they announced that they would enter the open market and repurchase their own Treasury debt. The Federal Reserve’s purpose in taking this action is two-fold: First, it further forces down interest rates on this debt. Again, the government is trying to force investors in cash to redeploy that money into higher yielding investments. Second, and most importantly, the Federal Reserve System is trying to flood the economy with cash. Every time the Federal Reserve purchases security instruments, it replaces them with cash. An investor previously thought that he was in a great long-term investment guaranteed by the government at a high rate of return. But the next day he finds that his bond is gone and that the government has replaced it with cash. Given that the alternative for investing that cash probably means an annualized return at less than 1%, then it is highly likely that this money will find its way back into stocks and bonds. My purpose in providing you with the foregoing is not to focus on open market actions by the Federal Reserve. Rather, it’s to illustrate why the government is forcing interest rates so low. An important byproduct of these actions will be mortgages that will be available within the next six months that have never been available in this country before. These low mortgage rates will make homeownership available to virtually all Americans. With small 3.5% down payments on FHA loans, homeowners will be able to purchase homes with government-guaranteed mortgages as long as they have reasonable credit and are employed. Coupled with the new Federal tax credit of $7,500 on a new home purchase (a 15-year no interest loan to eligible taxpayers), buyers will be able to make a down payment and qualify for loans. With loan interest rates, anyone who can afford an apartment in America should be able to own a home. The second benefit of these incredibly low interest rates is that it makes investors realize the folly of investing in cash. Today a one-month Treasury bond is yielding exactly zero percent. It will not be long before money market funds, based upon Treasury yields, will be negative. Additionally, taxable money market funds will continue to fall and before long all will be returning less than one-half of 1% annualized. The day will soon come when investors realize that their cash is returning nothing and they decide to reinvest their capital in stocks and bonds. When this finally occurs, the $3.7 trillion currently invested in money market accounts will create an unprecedented rush of buying. It will be the most spectacular bear market rally ever recorded. I wish I knew exactly when that will happen – it could be a week, a month or even six months. The timing is clearly uncertain, but the fact that it will happen is now assured. Clients often ask me why we do not sell out of stocks and bonds and put the money in cash until things recover. Quite simply, the explosive rally that will occur once the cash in money market accounts is reinvested will happen without warning. If you are not invested now, then it is likely you will miss that opportunity. Frankly, we don’t want to miss out on that opportunity and that is why we remain invested at all times. With the holidays and the end of the year just around the corner, we realize that 2008 has been a difficult year. We greatly anticipate 2009 to be significantly better, and in fact, given all of the actions by the Federal Reserve, it could be a record year by all investment standards. We hope that you have enough confidence to participate in that recovery. In the meantime, we wish each of you and your families a wonderful holiday season. We look forward to working with you in 2009. With the Federal Reserve cutting its interest rates to near 0% and a continued decline in rates on the long-term Treasury notes that mortgages closely track, rates on other types of mortgages dropped again this week, although not as much as the 30-year. "Interest rates for 30-year fixed-rate mortgage rates fell for the seventh consecutive week, moving these rates to the lowest since the survey began in April 1971," said Frank Nothaft, Freddie Mac chief economist. "The decline was supported by the Federal Reserve announcement on Dec. 16, when it cut the federal funds target to a record low and stated it stood ready to expand its purchases of mortgage-related assets as conditions warrant." The 30-year mortgage fell for the seventh consecutive week, dropping from 5.47% a week ago. A year ago the 30-year averaged 6.14%. It took a national average 0.7 point to obtain that rate, though; a point is 1% of the loan amount, paid upfront as prepaid interest. The 15-year fixed-rate mortgage averaged 4.92% with an average 0.7 point, down from last week when it averaged 5.20%. A year ago the 15-year loan averaged 5.79%. The 15-year mortgage has not been lower since April 1, 2004, when it averaged 4.84%. Five-year Treasury-indexed hybrid adjustable-rate mortgages averaged 5.60%, with an average 0.6 point, down from last week when it averaged 5.82%. A year ago, the 5-year ARM averaged 5.90%. One-year Treasury-indexed ARMs averaged 4.94% this week with an average 0.5 point, down from last week when it averaged 5.09%. At this time last year, the 1-year ARM averaged 5.51%. The sharp decline in rates has spurred a flood of mortgage refinance applications, the Mortgage Bankers Association said Wednesday. Crude tumbled below $37 a barrel Thursday to their lowest level in at least four years, underscoring the market's preoccupation with a sharp slowdown in oil demand. Year to date, oil prices have fallen 59% and are 75% since their record level above $147 a barrel in July. Oil for January delivery fell $3.84, or 9.6%, to end at $36.22 a barrel on the NYMEX. Not since the middle of 2004 has the price reached this level. Earlier, the contract hit an intraday low of $35.98 a barrel on Globex. The January contract will expire at the end of trading on Friday. The February crude contract, which showed greater trading volume, fell $2.94 to end at $41.67 a barrel on NYMEX. "Below $38, we don't see anything until the $25 level," said Edward Meir, an analyst at MF Global. "This is admittedly a rather dramatic set of chart-based forecasts for a complex that only six months ago looked like it could do no wrong on the upside." Obama named veteran regulator Mary Schapiro as chairwoman of the Securities and Exchange Commission and Gary Gensler to head the Commodity Futures Trading Commission. The president-elect said he would charge them with leading a broad overhaul of the financial regulatory system. "These individuals will help put in place new, common-sense rules of the road that will protect investors, consumers and our entire economy from fraud and manipulation by an irresponsible few," Obama told reporters in Chicago. "These rules will reward the industriousness and entrepreneurial spirit that's always been the engine of our prosperity, and crack down on the culture of greed and scheming that has led us to this day of reckoning," he said. Obama also named Georgetown University law professor Daniel Tarullo to fill one of the seven seats on the Federal Reserve Board, which is battling to ease a credit crisis and fend off a recession. The SEC, created after the 1929 stock market crash to police markets and restore investor confidence, has come under heavy criticism after the Wall Street meltdown and financial scandals exposed lapses in its oversight. The collapses of investment firms Bear Stearns and Lehman Brothers prompted scathing criticism from lawmakers who said the agency, charged with monitoring publicly traded firms, should have flagged the problems earlier. Criticism has intensified with the $50 billion investment fraud -- one of the biggest in history -- allegedly carried out over many years by Bernard Madoff. "We have been asleep at the switch. Not just some of the regulatory agencies, but some of the congressional committees that might have been taking a look at this stuff," Obama said. Obama, who takes office on January 20, said regulatory reform would be one of his earliest initiatives and he would release a detailed plan for regulatory changes. He said there was a need to potentially consolidate some regulatory agencies. Under one scenario backed by some lawmakers, the SEC would be merged with the CFTC, which oversees the markets for instruments such as futures contracts and options on oil, coffee, sugar and other commodities. "We are going to have to greatly strengthen our regulatory apparatus, and update it from what worked for a 20th century financial system, so that it works in a 21st century financial system," Obama told reporters. "I think the American people right now are feeling frustrated that there's not a lot of adult supervision out there," he said. 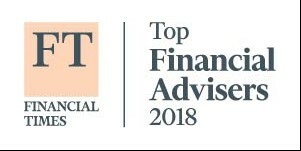 Schapiro is now chief executive of the Financial Industry Regulatory Authority, a self-regulatory body for the securities industry. She was an SEC commissioner for six years, then became chairwoman of the Commodity Futures Trading Commission in 1994 during the Clinton administration. Schapiro, a lawyer, is a member of the board of directors of Duke Energy Corp and Kraft Foods Inc. If confirmed by the Senate, Schapiro would replace SEC Chairman Christopher Cox, a Republican appointed by President George W. Bush. Gensler was a partner at Goldman Sachs for a decade and was undersecretary of the Treasury in the Clinton administration. Tarullo, Obama's choice for the Fed, has been one of Obama's top economic policy advisers. The 57-year-old Tarullo was President Bill Clinton's top adviser on international economic policy. He would replace Fed Governor Randall Kroszner, whose term expired in January, in a move that still leaves two vacancies that Obama can fill. Obama is hoping to complete most of his Cabinet picks by the end of the week, leaving Chicago on Saturday for a vacation in Hawaii with his family. OPEC oil ministers agreed their deepest output cut ever on Wednesday, cutting 2.2 million barrels per day from oil markets in a race to balance supply with rapidly crumbling demand for fuel. The 12 members of the Organization of the Petroleum Exporting Countries (OPEC) were also aiming to build a floor under prices that have dropped more than $100 from a July peak above $147 a barrel. The cut, effective January 1, comes atop existing curbs of 2 million bpd agreed by OPEC since September. It lowers the supply target for the 11 members bound by output limits to 24.845 million bpd -- down nearly 15% from September output. "I hope we surprised you -- if not, we have to do something about it," said OPEC President Chakib Khelil, host of the conference. Oil prices fell $3.54 a barrel to $40.06 following the deal after weekly U.S. data showed inventories in the world's biggest consumer continued to swell. Washington quickly condemned OPEC's attempts to end cheaper oil prices. Its cut, the third this year, brings a total reduction in OPEC supply to 4.2 million bpd, taking nearly 5% of world supply off the market. "OPEC has an obligation to keep the market well supplied and to consider the health of the global economy, so efforts to limit the benefits of lower energy prices are short-sighted," said White House spokesman Tony Fratto. "The world economy is driving the price more than anything OPEC can do at this stage," said Gary Ross, CEO of consultancy PIRA Energy. "It will be hard for the cuts to have any traction with regard to price in a deteriorating economic environment." OPEC's president said the group would do its utmost to ensure new restraints were strictly enforced. "I can tell you it's going to be implemented and it's going to be implemented very well because we do not have a choice," said Khelil, also Algeria's energy minister. "If not, the situation is going to get worse." Saudi Arabia, the world's biggest oil exporter, has led by example -- reducing supplies to customers even before a cut was agreed to help push prices back toward the $75 level Saudi King Abdullah has identified as "fair." "The purpose of the cut is to bring the market into balance and avoid the gyrations of the price," said Saudi Oil Minister Ali al-Naimi. "The cut may lead to higher prices or may not." OPEC hopes that a sharp supply cut will set oil on the path toward $75 -- a level the group believes is needed to encourage investment in future supply. "You must understand the purpose of the $75 price is for a much more noble cause," the Saudi Oil Minister said. "You need every producer to produce and marginal producers cannot produce at $40 a barrel." The influential Saudi Oil Minister clearly outlined the kingdom's route to lower production. It is pumping 8.2 million bpd against 9.7 million bpd in August. Saudi Arabia's implied output target is about 8.477 million bpd under existing OPEC curbs. According to independent observers cited in OPEC's monthly report on Tuesday, the group's compliance in November to existing cuts was only just over 50%. Leading a high level delegation, Russia's Deputy Prime Minister Igor Sechin said in a speech to OPEC that Moscow did not plan to join in coordinated output cuts and did not want to join the group in the foreseable future. The Federal Reserve pulled out all the stops in its campaign to save the U.S. economy Tuesday, slashing interest rates to just above zero and promising to try an array of new economic measures to stimulate spending. The central bank's Federal Open Market Committee established a target range for the federal funds rate of zero to 0.25%, effectively cutting its key rate for overnight lending to banks by between 0.75% and 1%. Rates will need to be kept low "for some time," the central bank said. U.S. stocks leaped after the decision, with the Dow closing up 359 points (4.2%), the S&P 500 up 45 points (5.1%), and the NASDAQ up 82 points (5.4%). A senior Fed official told reporters that the Fed has switched tactics and will now focus on aiding credit. The Fed has already targeted a few debt classes for assistance. The senior official said that other classes, including below triple-AAA quality debt, may be purchased. The official said the program was not quantitative easing as practiced by Japan in the 1990s. While Japan simply wanted to increase the quantity of money, the Fed wants to focus on the asset side of the balance sheet. The moves are just about as aggressive as the central bank could be on monetary policy. The Fed gave clear signals that it has moved on to other measures beyond setting interest rates in its fight to keep the economy rolling. But the senior Fed official said that economists at the central bank generally are in agreement with Wall Street economists about the duration and depth of the recession. After two quarters of very weak growth, the economy should start a slow recovery after mid-year, the official said. The Fed statement said that inflation should continue to moderate in coming months. The senior Fed official said that deflation, or a general price decline, was not a major risk at the moment, but that price data would be watched carefully. "The Federal Reserve will employ all available tools to promote the resumption of sustainable economic growth," the central bank pledged in its policy statement. Going into next year, the focus of the Fed's policy will be to support financial markets and stimulate the economy "through open market operations and other measures that sustain the size of the Fed's balance sheet at a high level." In a speech on December 1, Fed Chairman Ben Bernanke said the central bank had a menu of measures from which to choose to lift the economy even if rates fell to near zero. "Although conventional interest rate policy is constrained by the fact that nominal interest rates cannot fall below zero, the second arrow in the Federal Reserve's quiver -- the provision of liquidity -- remains effective," he said. So the key will be the quantity of money in the system, not the price. The Fed's balance sheet has risen to $2.25 trillion over the past two months from $850 billion and has made promises to spend about a $1 trillion more. The Fed is using the money to ease strains in the market for the debt of Fannie Mae and Freddie Mac and mortgage-backed securities issued by these GSEs. These purchases may be expanded, the Fed said. "The FOMC is also evaluating the potential benefits of purchasing longer-term Treasury securities," the Fed said. By February, the Fed is also going to begin buying credit card debt and student loans. This template could be expanded. Under this plan, the Treasury is assuming the risk of loss while the Fed is making the purchases. Economists applauded this laser-beam approach. Adding "$100 billion here and $100 billion there strategically injected into the right places" can have a big impact, said Steve Stanley, chief economist at RBS Greenwich Capital. Other markets are clearly on the Fed's radar screen. "The Fed will continue to consider ways of using its balance sheet to further support credit markets and economic activity," the statement said. The senior official said that lower quality assets could be purchased. The vote to lower the fed funds rate was unanimous. The U.S. Congress voted to ease pension-funding requirements and excuse older retirees from having to cash out retirement funds in an attempt to blunt the recession’s impact on their savings - the measure is only for 2009 and not for 2008 required distributions. The Senate approved legislation last Thursday by unanimous consent to eliminate various penalties on companies whose pension funding falls below federal guidelines. The bill would also temporarily suspend requirements that people aged 70 1/2 begin cashing out assets in individual retirement accounts and 401(k) and 403(b) savings accounts. The vote, one day after the House approved the plan, sends the measure to President George W. Bush. White House Spokesman Tony Fratto declined to say whether Bush would sign the bill into law. “We continue to have concerns about measures to reduce funding for worker pensions,” Fratto said in an e-mail. Hundreds of companies petitioned Congress to relax the pension rules, saying the economic slowdown has slashed the value of assets in the accounts, which could force businesses to make unexpectedly large contributions to meet federal minimums. Companies are required this year to set aside enough money to cover at least 92% of projected pension liabilities. Those that fall short must fully fund their pensions immediately. In some cases, they can also be forced to freeze the plans, which would prevent employees from accruing additional benefits. The legislation would eliminate a requirement that companies falling short of the 92% threshold immediately jump to 100%. It would prevent many companies from having to freeze their pensions and would suspend for one year the penalties imposed on those 70 1/2 who don’t make minimum required withdrawals from their retirement accounts. The government charges a 50% tax on the amount that should have been withdrawn. That penalty is designed to prevent IRAs and other tax-advantaged retirement savings accounts from becoming tax shelters used to pass wealth on to heirs. Critics said the law forces the elderly to sell retirement assets when their value has plummeted because of the slumping economy. Note - This was supposed to post on Monday morning. The U.S. Federal Reserve is expected to drop interest rates to 0.50% on Tuesday, but anticipated remarks on unconventional methods to dispel a year-old recession are what will really matter. Economists forecast a clear statement that the U.S. central bank will aggressively deploy so-called quantitative easing measures to shelter the economy from a steepening downturn, but do not expect details of what steps it will actually take. Those words would accompany a decision by the Fed to lower its target for overnight rates by at least a half-percentage point, economists believe. A half-point cut would take the bellwether federal funds rate to just 0.50%, the lowest on records dating to July 1954, as the central bank battles a recession many think will stretch well into next year. The announcement is expected around 2:15 p.m. on Tuesday at the end of a two-day meeting. The gathering had initially been scheduled for a single day, but was extended so policy-makers could study options for unusual steps to spur the economy with little room left to lower borrowing costs. "From here on out, monetary policy has to rely primarily on non-traditional tools, tools other than the funds rate, to try to stimulate the economy," said former Fed Governor Lyle Gramley, who expects the Fed to spell this out. "They are certainly going to have to acknowledge that non-traditional methods are going to be employed aggressively to try to provide assistance to the economy," he said. Quantitative easing, which the Bank of Japan used to end a decade of deflationary stagnation in the 1990s by pumping money into the banking system, was foreshadowed by Fed Chairman Ben Bernanke in a speech on December 1. He emphasized the Fed would use all the weapons in its arsenal to protect the economy, and identified direct purchases of government and mortgage-related debt as possible options. With yields on U.S. government debt already very low and private borrowing rates high because loss-scarred banks are too scared to lend, economists think it more likely the Fed will target private-sector mortgages to drive down home loan costs. Buying such bonds should narrow the spread between their yields and yields on debt issued by the U.S. Treasury, and allow banks to offer home loans at lower rates. Lower mortgage rates should raise demand for houses and stem the slide in home prices, which would help staunch massive bank losses that have touched off a global credit crisis. "My one-word advice to the Fed now is 'spreads.' Fortunately, I don't think Ben Bernanke needs this advice. He gets it," said Alan Blinder, a former Fed vice chairman and professor of economics at Princeton University. The Fed has already embarked on quasi-quantitative easing by allowing its balance sheet to more than double in size after pumping over $1 trillion into financial markets to prevent them from seizing up completely in the face of mounting losses. Such liquidity measures are traditionally "sterilized" so they do not expand the money supply and stoke inflation. But the Fed has abandoned this practice in an effort to reduce private borrowing costs that have so-far remained elevated despite dramatic official interest rate cuts. In addition, inflation fears have been replaced by worry that prices may fall too far and inflict deflation, similar to the Japanese economic conditions of the 1990s. "The focus will be on purchasing assets to affect spreads. All of their policies are aimed at driving down borrowing costs to consumers and businesses," said Dean Maki, co-chief U.S. economist at Barclays Capital in New York. By driving down borrowing costs, The Fed will look to entice consumers and businesses to borrow and spend to rejuvenate the housing market and economy. Apply for a Federal Bailout! On this Sunday with all of the economic and political news filling the newspapers, airwaves, and internet, we decided that a moment of comic relief might just give a few moments of smiles and laughter. Below is a piece written by Bruce Feirstein of Vanity Fair that we hope you enjoy. If you’re like most of us on this first day of December 2008, you’re probably looking at your bills and your gift lists and the endless list of people you have to tip this month, thinking, Hmmmm, I could use some of that federal bail out money just about now. But how do you get your hands on some of those billions? How do you apply? How does Hank Paulson decide why Citibank lives and Lehman Brothers dies? Well, it turns out that V.F. contributing editor Bruce Feirstein has discovered the über-top-secret Federal Bailout application—the one-page “EZ-CASH” form that’s been making the rounds at corporate board rooms, weekend ski chalets, and NetJets waiting rooms all across America. Click on the image to see the form, fill it out, and you too can be rolling in cash again. 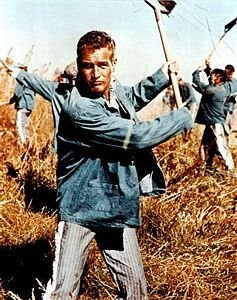 When thinking about the economy lately, I’ve found myself being reminded of Paul Newman’s character, Luke Jackson, in the 1967 film classic, “Cool Hand Luke.” For those who are unfamiliar with the movie, Luke was a spirited inmate in a Florida prison camp who refuses to conform to the system. To the aggravation of the prison Captain, but to the delight of the other prisoners who idolize him, Luke cleverly escapes time and time again only to be captured and returned to the camp. In another famous scene, Luke has a boxing match with Dragline, another prisoner played by the great George Kennedy. Dragline is three times as big as Luke, and easily knocks Luke down with every blow. But Luke will not give up – he manages to get to his feet after every knockdown, even though Dragline implores him to stay down since he’s so badly beaten. With Luke still swinging away, Dragline finally just walks away. The U.S. economy has been reminding me of Luke Jackson lately. There is no question that the economy is terrible right now; there’s no question that consumer sentiment is at an all-time low, and; there’s no question that the stock market has been severely impacted by the economy and consumer sentiment. In spite of those beatings, the economy keeps standing up and fighting for its ongoing recovery. It seems that all of the positives we presently have in the economy are failing to be communicated to the general public. For example, this morning the Department of Commerce reported that – excluding car and gasoline sales – retail sales were actually up in the month of November. How many times have you heard over the last weeks and months that retail sales are expected to be terrible because consumers are tapped out? Why is there such a diversion between the news we hear on TV and the actual facts? It was announced yesterday morning that European corporations issued more bonds during the month of November than in the entire history of debt in European bonds. Why do we only hear that there is a lack of credit availability when an entire continent is establishing records in the issuance of new debt? As I write this post, the S&P 500 is essentially flat for the month of December. The news has been dreadful lately, and because of that, the public’s presumption is that the market has been down enormously in December. However, the facts truly do not support that perception. There’s no doubt that the market has been extremely volatile and that the down days have been more dramatic than the up days. Regardless, a foundation has indisputably been established that reflects we are working in a positive vein in trading. The financial news may not tell you that, but the facts are undeniable. This past week, it was announced that Federal Reserve Chairman Ben Bernanke intends to start issuing bonds through the Federal Reserve System. Not Treasury bonds, but bonds from the Federal Reserve System itself. Many people wonder why the Federal Reserve System would actually need to reduce the money supply with all the money currently being injected into the banks. As I have explained before, the way the government reduces the money supply is by forcing member banks to purchase bonds. After a bank closes for the bank and before they reopen the next day, bonds replace their available cash, leaving the banks without liquidity during that timeframe. Without liquidity, the banks are unable to extend credit and reduce inflation. Although this didn’t receive much publicity, it’s clear to me that the Federal Reserve’s purpose in issuing bonds through the Federal Reserve System is to reduce cash in the system. There is such an enormous amount of cash floating the financial system at the current time that the Federal Reserve is anticipating severe inflation issues in the future. I find it somewhat strange that the Federal Reserve would be concerned about inflation when all you hear about in the financial news is the possibility of deflation. The money supply has grown over the last 12 weeks to $317 billion. Annualized, that is $1.373 billion. That kind of money growth is unprecedented! I also can’t help but notice that interest rates continue to fall. In previous posts I have discussed the three-month Libor rate, which was at one time a severe detriment to interbank lending. Earlier, the three-month Libor was at 6%, but today that rate has dropped all the way down to 1.92%. The credit market has dramatically improved over the last several months, but that would be nearly impossible to tell by watching the financial news alone. The Treasury would enter the open market and sell 30-year Treasury bonds at 3%, and then they would turn the money over to Freddie Mac and Fannie Mae to distribute long-term mortgages to new homeowners and to refinance mortgages at 4%. Even though the government would have to pay the interest at 3% on the debt, they would still be earning 4% on the money. This one step alone would provide the opportunity for rescuing the residential home market early in 2009. I continue to hear the so-called experts recommend that investors buy 10-year Treasury bonds, which today are at 2.58%. It is almost a given due to the liquidity currently in the system by the government that inflation will accelerate in coming years. It is highly likely that in a few years, inflation will far exceed the 2.58% coupon rate on this U.S. Treasury bond. If an investor wants to sell this bond anytime during the 10-year period, it is highly likely that they will lose principal. For example, if current interest rates on a 10-year Treasury were at 4%, then when you attempt to sell this bond with a coupon of 2.58%, you will lose approximately 40% of your principal balance. How any knowledgeable investment advisor could recommend to their clients that they should purchase an instrument that cannot be profitably sold during its term – and one that will unquestionably have a negative rate of return – defies logic. Much has been said about the potential risk of the TARP funds potentially costing taxpayers billions of dollars. It seems that few people are giving credit where credit is due. The current five-year Treasury rate is 1.56%. The economics of the TARP money is relatively simple: the TARP money invested in the financial institutions has a five-year window. The Federal Reserve borrows money from the general public in the open market at 1.56% and then invests it in banks earning 5%. There’s almost no chance that this TARP money will not be a net positive for the Treasury at the end of five years. However, in the last week I have heard numerous politicians and commentators express dismay over the billions that were wasted in bailing out the banks. Statements such as those are nothing short of blatantly false! According to the FBI, Madoff’s investment-advisory business “deceived investors by operating a securities business in which he traded and lost investor money, and then paid certain investors purported returns on investments with the principal received from other, different investors.” The SEC said it was an ongoing, multi billion-dollar rip-off and they asked the court to confiscate the firm and its assets. It should be emphasized that Madoff’s investment-advisory firm is operated completely differently than Rollins Financial’s. The funds in our clients’ accounts are maintained at an independent custodial firm – either Charles Schwab & Company or Fidelity Investments. Our clients receive statements on a monthly basis from the independent account custodian, and clients have access to analyzing their accounts through the custodian at any time. This is materially different than the way Madoff operated his investment-advisory business. At Madoff’s firm, all of his clients’ money was commingled making him able to pay returns to some clients by using new money coming in from other investors. Madoff himself referred to his actions as “a giant Ponzi scheme.” While Madoff’s actions are devastating to his clients, it will have no effect on the future of stock market investing as a whole. Rollins Financial has no commingled money in our clients’ portfolios, nor do we even have the ability to commingle our clients’ portfolios by virtue of using Schwab and Fidelity as independent account custodians. Therefore, the risks associated with being a client of a firm like Bernard Madoff’s are not inherent in our business model. I recognize that 2008 has been a disaster for the financial markets. However, there is a significant fix in place. The government is doing everything necessary to create liquidity and to improve the financial markets. You may not hear about this in the financial press, but there is evidence everywhere that the coordinated worldwide efforts to improve the economy are working. Why the general public believes it is not working has more to do with the financial press’s “failure to communicate” all the facts. There is no question that nearly all economists are forecasting a turnaround in the economy sometime during 2009. Today we are only three weeks from the beginning of 2009, and I only wish that the general public could take a good, hard look at the positive effects of the rush of liquidity before making a decision that will harm their financial security for years to come.